More than lumpy gravy, slumping pie crusts, and dry dressing it’s the turkey that causes the most angst around Thanksgiving. And for good reason. It’s a huge piece of meat, cook time depends on a host of variables from how much other stuff is in the oven to whether or not it was fully thawed, and the bird itself is notorious for being dry. Still, despite all the reasons why most sane people would opt for any other cut of meat, we persist on having it be the centerpiece on our tables this time of year. I have a huge folder full of notes for this Thanksgiving project and most of them are about the turkey. There’s so much that I feel like I need to tell you. From the pros and cons of natural versus self-brining turkeys to how big a turkey you should purchase based on the number of guests who plan to eat it. I have to tell you, we’ve made this whole turkey thing very complicated. 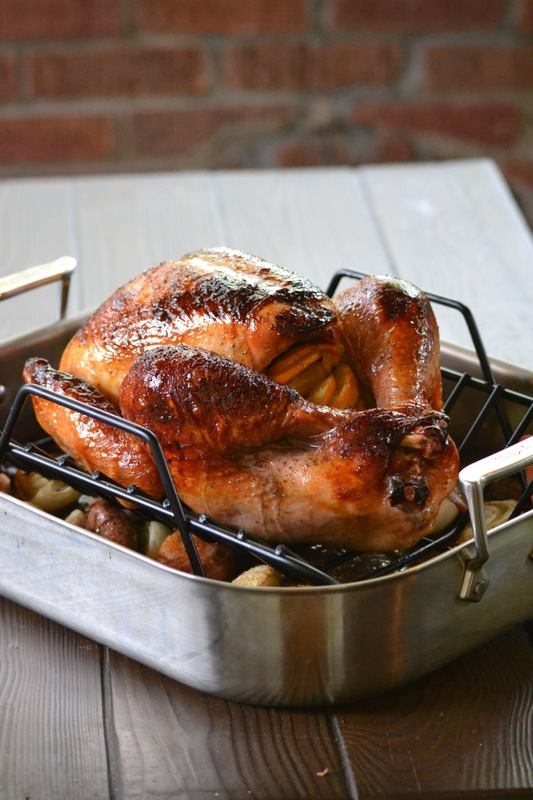 In an effort to simplify it, here’s my handy list of the five things you need to know about cooking turkey followed by a detailed recipe for Bourbon-Maple Roasted Turkey with an out of this world bourbon-maple syrup glaze. And lest you think I forgot the gravy, don’t fear. It will show up in your feed tomorrow; let’s limit ourself to one challenge at a time shall we. Big or Bigger? For every guest, plan on 1 lb of turkey. 12 guests coming? Then you’ll want to buy a 12 lb turkey. 18 guests? 18 lbs of bird. Got it? Frozen Turkeys Frozen turkeys are less expensive, but you have to thaw them. This step is important. Not thawing your turkey completely will result in longer cooking times. For every 5 lbs of turkey, plan on one day of thawing and I always add an additional day just to make sure it’s ready to go. Under no circumstance should your turkey be thawed on the counter. I also don’t recommend thawing under cold water – it’s a recipe for problems. To Brine or not to Brine. Everyone has an opinion -see here and here and here and here. Mine is this: If purchasing a self-brining turkey, don’t brine it and be judicious when it comes to adding salt in either a brine or seasoning. If purchasing a natural or organic chicken, I like to brine it as it keeps the turkey moist and makes it a little more foolproof for the cook. America’s Test Kitchen recommends soaking a 12 to 17 lb turkey in a brining solution of 2 gallons cold water plus 1 cup salt for 6 to 12 hours in the refrigerator. For an 18-24 lb turkey, use 3 gallons cold water and 1 1/2 cups salt. If you plan on brining and marinating, brine first then marinate as directed in the recipe. When can we eat? Timing the turkey may be the hardest part. 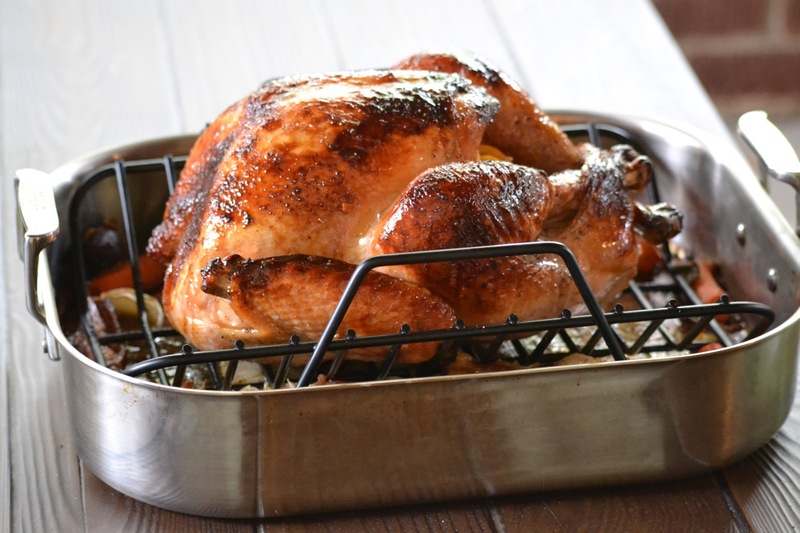 In general, plan on 20 minutes per pound at 350 degrees, but be aware that basting, not properly thawing, and/or densely stuffing your bird will result in longer cook times. How do you know for sure when it’s done? Temperature. Here’s how to check it. Now I have to carve it!?! Yep. Don’t worry; I found you pictures. The marinade used in this recipe may seem insufficient, but I find that it is easier to simply turn the turkey during its marinating time then to try to mess with a large turkey and a lot of liquid. Large brining or XL Ziploc bags work great for this task. If you plan on brining your turkey, brine it first then marinate. Prepare the turkey by removing the giblets and neck from the cavity (don’t discard these items and keep refrigerated) and trimming excess fat. I also like to cut the tips of the wings off at the joint, as they tend to burn during cooking – add these tips to the giblets and neck and reserve. Place the turkey in a large brining or oven bag or an XL Ziploc with the orange slices. In a medium bowl, whisk together the bourbon, maple syrup, apple cider, oil, salt, and freshly ground black pepper. Stir in the smashed garlic cloves. Pour the marinade over the turkey in its bag. Place the turkey in its brining bag in a large bowl or on a large baking sheet (just in case your bag leaks) and refrigerate. Turn every couple of hours to make sure that every part of the turkey has some time in the marinade; marinate for at least 8 hours or as long as 24 hours. When ready to cook the turkey, preheat the oven to 425 degrees F and place a rack in the center of the oven. Remove the turkey from the marinade (but do not discard the marinade) and pat dry with paper towels. Scatter the carrots and onion wedges over the bottom of a large roasting pan. Place the wire rack atop the vegetables and place the turkey, breast side-up, on top. Season the turkey and its inner cavity with salt and freshly ground black pepper. Remove the orange slices from the marinade and stuff them with the sage sprigs loosely (you may not be able to fit all of them) in the cavity of the turkey. Rub the softened butter over the turkey and under its skin. Truss the turkey with kitchen twine and pour 1-½ cups of the reserved marinade over it. Place the turkey in the oven and roast for 45 minutes. The butter will cause the turkey to brown quickly so watch it carefully during this first part of cooking. You want the skin to have a rich brown color, but if it appears to be browning faster than you would like gently cover those areas with a sheet of foil to prevent burning. While the turkey is roasting, make the glaze. In a small saucepan, combine the bourbon, water, maple syrup and dark brown sugar. Gently reduce to 1/3 cup and then remove from the heat to let cool. Reduce the temperature to 350 degrees. Baste the turkey with pan juices and continue roasting, basting the turkey and checking its temperature every thirty minutes after the first hour. To get an accurate temperature, be sure to stick the thermometer in the thickest part of the turkey (see blog post on Bourbon-Maple Roasted Turkey for how to do this). When the temperature reaches 150 degrees F, remove the turkey from the oven and brush with the glaze. Return the turkey to the oven and continue roasting, brushing with glaze every 15 minutes or until the turkey registers 165 degrees F in its thickest part. Like before, if the turkey starts browning too quickly or burning, cover that area with a piece of foil. Once the temperature is 165 degrees F remove the turkey from the oven and let it rest. See the blog post for general baking times, but plan on about 3 ½ hours. Let the turkey rest for at least 30 minutes before carving. This gives you time to make the gravy (see tomorrow’s blog post) and pull together the rest of your meal. 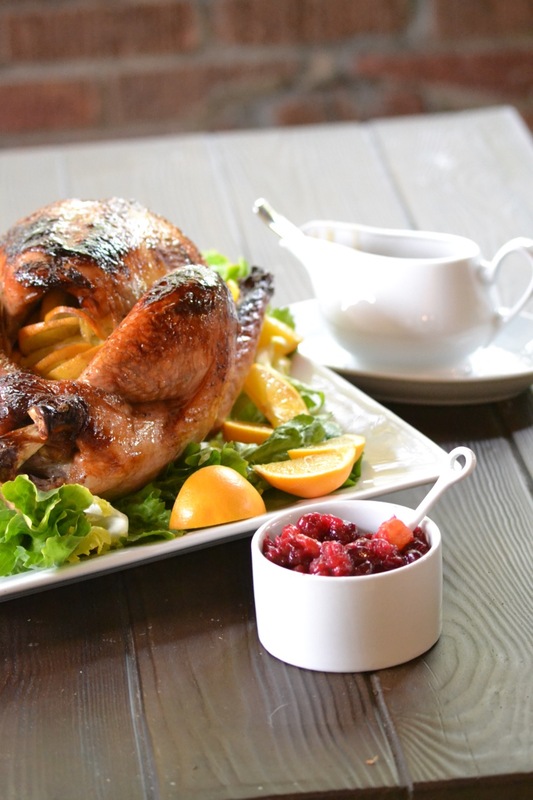 If displaying the turkey, place on a bed of sturdy lettuce (escarole is great) or kale and garnish with orange slices.